Planning a party? Well if you are, you probably have a strict budget and would rather do things yourself if you could. 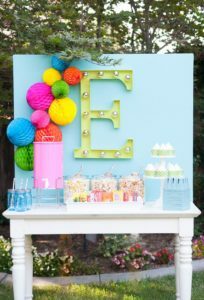 I get it, whenever I plan parties which are usually for my mom, dad or niece I usually head for Pinterest for great party decor and DIY ideas that I can easily do myself. 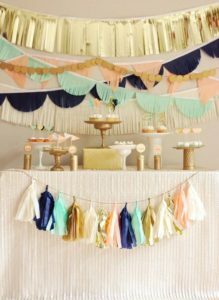 Here are 11 Party decorating DIY ideas that will definitely help you throw a fantastic and well decked out party. 1. What is a party without balloons? 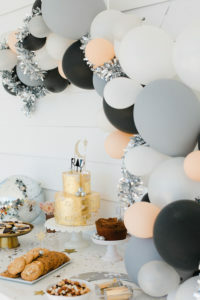 Balloons are obviously decor accessories for your party. But what if you could customise your balloon to your liking? Awesome isn’t it. Check out the tutorial here. 2. If air balloons are not your thing you can use regular balloons. 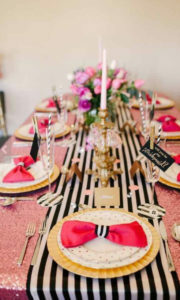 This party theme is Rock & Roll and the decor is just amazing and easy to do. A trip to the dollar store will help stretch the budget a far way. 3. This Backyard Movie Theme Party is great for the summer. 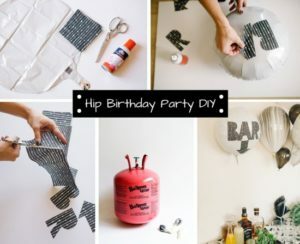 Again another DIY party decor you can do by taking a trip to the thrift store. Tutorial Here. 4. Tassels are so easy to do. I found this idea on Pinterest however; sadly I do not know the source would love to see how they did the backdrop. The colour coordinates well. 5. This black and white runner gives life to this table. You can purchase this from Knot and Nest Design. 6. They did a great job designing this party decor. 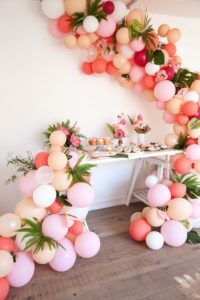 How creative, the use of balloons and palm leaf to give an island/Caribbean like theme party. 7. 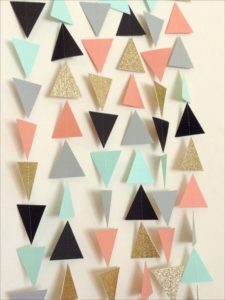 This geometric triangle garland paper backdrop can be purchase here down below on Etsy. 8. DIY Glitter Party Hats. Find the tutorial at Studio DIY. 9. 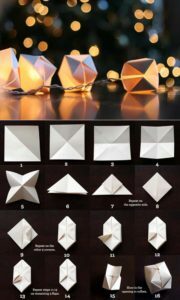 1-2-3 step Paper Cube String Lights. 10. 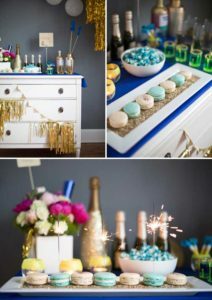 Another idea for your party. 11. Paper Cup Lights. Find the tutorial at Lights 4 Fun. Let me know what you think of these gorgeous ideas.